Benjamin M. Keith III, better known as 'Mr. Tramp' in the world of tattooing, was a Gypsy Tattoo Artist from Forth Worth, TX. After searching the internet for information on my old friend, I came across a few sites where other Artists had mentioned that they had been taught by and/or studied under Mr. Tramp. If you have been searching for information on him as I have been for the last few years. I was never able to find out much about his history for many years, untill the internet came alone it seemed like it was a dead end road. To help fill the gaps and set the story straight. I have some information on him that you may find interesting. In December of 1966 I was transferred to Aschaffenburg, Germany with the U.S. Army's 9th Combat Engineers Battalion. The first time I met Benny was the day he was released from the U. S. Army Military Stockade at Mannheim, Germany after serving a jail sentence for violation of some Army Regulation, but, anyway... We served in the same Company & Squad. We became good friends and drank our share of Rum & Cokes at a local night club called the Dixie Club, which was the favorite hangout for the young service men stationed in Aschaffenburg. I remember that Benny told me he came from a military family. His dad was an lifer, a career soldier. I can still recall most of the things our unit did, like building bridges, tank pads, and culverts, and that we dug a LOT of ditches at Hohenfels and Grafenwoehr, Germany. Most of that work was done in the winter months. Some kinda cold as I remember. 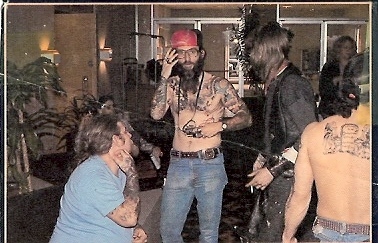 When Benny found out that I had been a Tattooist in St. louis before I joined the Army, he wanted to know all about it. So, I told him the usual tales that you would expect from an 18-year-old Tattooer . Benny was two to three years older than me, and near the end of 1967 he rotated back to the States, but before he left he had me do a Tattoo design he had drawn up himself. It was a Maltese Cross, hanging from a small chain, hooked to a wreath, with the word 'Tramp" tattooed above (a take-off on the Army Expert Rifleman badge). Tramp was the ringleader of a click of friends that hung out together. Eventually there would be three men that got that same design (with their own names above the wreath). The first person other than Benny to use that design was a young soldier from Chicago by the name of James Pierce. The second one was a young red-headed fellow from Washington state. I can't recall his name, we just called him 'Red', and that's what I Tattooed above his wreath. Working on their tattoos at night. By the time I'd finished the second Tattoo it was to late to do Tramp's. The next day I was busted by the Company Commander for 'slingin' ink' in the barracks. It seems that Red woke up that morning and went on sick call because his new tattoo was all red and swollen, like most new tattoos will do. He more or less "snitching me out" by going on sick call. The Company Commander gave me an Article 15 for tattooing, then he took my Tattoo Kit and had it mailed to my home in St. Louis. Before Benny could get his Tattoo, and not wanting to be left out, he ask me to do his Tattoo Jailhouse Style, which I did. Years later I was surprised to see Benny on the front cover of a Tattoo Magazine, with his original Tattoo design that I tattooed on him. There it was for all the world to see. I didn't teach Tramp to be a Tattooist, but I think I did plant the seed with my tales of the life of a Tattoo Artist. Just before he rotated back to the states I tolded him if he wanted to get into the trade to look up Leon Miller in Kileen, Texas. That he was an old Tattooist that I had bought supplies from at times, and that he could hook him up. Benny left the Army much the same as when he came in. He had earned some rank before his jail time, but was busted back down to PFC . After 4 years in the Army I guess he just wanted to get back to Texas. And that's the true story of how Mr. Tramp got his very first Tattoo, by a young man known as Domo. Around 1981 or 1982, on one of my road trips, I stopped by his Ft. Worth shop (which appeared to be an old gray gas station) to visit with him. But I'd just missed him. I remember talking to a fellow that lived next door to the shop and he told me that Tramp had went up to Colorado. Can't remember that fellows name, but I remember he was working on a motorcycle that had the word "Wind Walker " painted across the bike. I gave him a newspaper article about my shop in Tennessee that I signed "Bozo" and ask if he would give it to Tramp when he got back. I don't know if he ever got the newspaper article or not, as I soon left Texas and move on to other places. A few years later I heard that Benny got killed in a motorcycle crash out in North Carolina. My how time slips away!